I guess you missed the bigfoot in Chris' pics. It stands right between Santa Claus and Michael Jackson. This is a brief post to clarify that upthread, I posted a link to a wiki page which purports to contain a pic of a Cross River gorilla taken in 1906. I made the mistake of taking wiki's word on the claim, without examining the photo for myself. I glanced at the small pic, read the (now falsified) blurb and posted the link here. My bad! I consider wiki as the beginning of research, not the end. This is one of the few times I've linked to something on the wiki site without first vetting it for myself. I'll take it as an object lesson in critical thinking and the adage that one should always check one's sources. ETA: The pic's file history says it came from this site about the Ibo of Nigeria. The words "Young gorilla (?) killed at Asaba, So. Nigeria, west Africa, 1906." are hand-written (apparently by an anonymous chronicler, possibly but not definitely the photographer) at the base of the photograph. ETA2: Here's the page on the Ibo site that contains the pic. The author of that site does not claim the animal is a Cross River gorilla. The error, then, originates with wikipedia editor AdamFromTheVillage, who on Dec. 17, 2012 added the false description: "Igbo children with a dead Cross River Gorilla." -- whether by honest mistake or intentional fraud remains unclear. ETA3: However, the Ibo site does attribute the photo to "R. L. Beard", which a quick yahoo search reveals is a joke internet name. For me this is where the trail runs dry, and with that I'll drop it. Last edited by Vortigern99; 15th August 2013 at 05:11 PM. There is no way possible to have an intelligent conversation about primate anatomy with folks that can't tell the difference between a chimp and a gorilla. I never said anyone was foolish. As a matter of record, I don't name call if someone doesn't agree with my opinion. Bill Munns has put together a very informative presentation that addresses many of the skeptical issues with the PGF to my satisfaction. Yet the most common response on skeptic sites is to attack Bill's character or qualifications, and those of anyone that may agree with his findings. Many claim to "see no movement" on the two specific frames used for the "shockwave" portion of the presentation. Well, I do see movement as does anyone else that views those frames. So the arguments otherwise to me seem dishonest. So once again I will say, there is no way possible to have an intelligent conversation about primate anatomy with folks that can't tell the difference between a chimp and a gorilla. Folks that argue Patty's muscle shape should be an exact match with those of humans,it's ridiculous. Possible resemblances may be noted, but not an exact match muscle shape per muscle shape of two separate species. Bill's "shockwave" presentation concentrates on movement thru soft tissue which is fluid dynamics and as Bill has shown, these results are testable and repeatable. No need for an exact match of size and shape of the "vessels" thru which the shockwave travels, only the similar wave shape need be observed (or the lack of wave travel). Chris B.
Chris knew it was a chimpanzee the whole time, apparently. The fact that some members did not, is a matter of importance for Chris, he mentions it twice, but does not consider "gotcha" moments "productive". Something I find rather typical is his dismissal of the arguments here because some "attack Bill's character or qualifications" .. sure let's seize on that, that's all people do.. have done.. in these threads is attack Munns' character. Someone might be "offended" by such attacks on Munns' "character" , but an honest person does not just run off at the slightest offense with their "victory" "card" like that. " Welp, most of the members there are mean to Bill, therefore I can dismiss everything everyone there has ever said! " Using the cross river gorilla as an example that animals can stay elusive is frowned upon, yet something as genetically different from Bigfoot like a wolverine is used as an example that animals can't stay hidden? You're still missing the point about the gorillas. They are rare because people hunt them and destroy their habitat. If they were elusive like bigfoot is elusive then hunting would not affect them. If they could withstand habitat loss like Bigfoot does, then habitat loss would not be a problem for them. 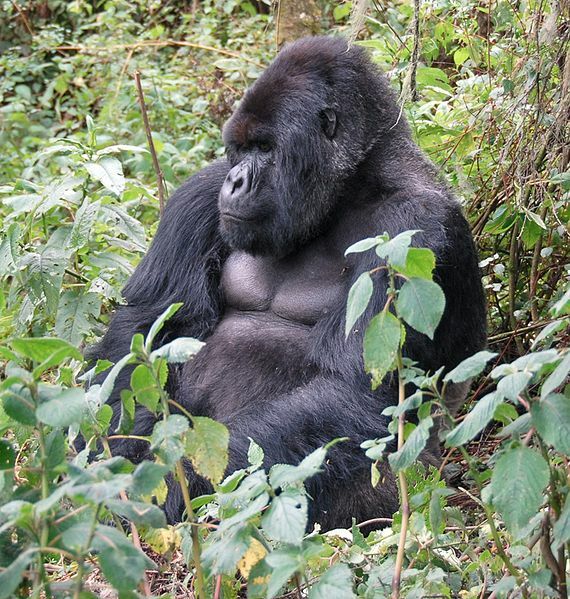 Cross River Gorillas are not like bigfoot. I cannot explain the "how" or "why" they are here but they are. But I don't think anyone can give an honest answer to either question about any species on the planet. The picture of the 9 foot subject is not proof I agree, but whether anything is there or not is a matter of opinion for everyone except the person that took the picture. Would you say the same about the family group video on youtube? The still on the top page of my site is taken from it. Most of the photos on my site were failed attempts to capture good images of what I saw during those encounters. None, are acceptable as evidence of proof of Bigfoot. What is there to debate? I know you want me to say "Bigfoot is real because of this or that photo." So you can tear me apart for making a ridiculous claim. I don't accept the creatures as proven to exist by a photo because neither does the scientific community. My best effort to date is the family group video but that's still not proof. As far as the Chimpanzee photo. No I did not set a trap for anyone. In my experience I would guess it was likely someone of a skeptical nature that made that photo available on WIKI for whatever reason. My point was and is that like Greg Long's book, many make the mistake of accepting something as fact without checking it out for themselves. That's not investigation and can get one into trouble. If you checked out that photo on your own accord and suspicions, my hat is off to you because you truly posses the "show me" aspects of a true investigator. Even if it took a hint to get you started (and only you would know this), then you still followed thru to investigate a suspicion and that's still a credit to your record IMO. We don't have to agree whether or not Bigfoot is real. We do need to agree on the method used to determine them as being real or not though. Would you say the same about the family group video on youtube? The still on the top page of my site is taken from it. Yes, I would say the same thing. I don't see a Bigfoot there Chris.. again.. why would you think that you are encountering Bigfoots in modern Kentucky? What makes that a plausible explanation for you? At about 3:13 is where you start to describe a Bigfoot shelter you guys found... why? That is the least likely explanation. Wolverines are rare and yet they are found anyway, photographed anyway, and found dead anyway, and they are small and hide easily. An 800 pound 9 foot tall furry biped should be just a little easier to find, don't you think? We can also see the signs left behind by a wolverine, even when we can't find him. We can tell where he's been, what he's been doing, what he's been eating, where he's been living, etc. 800 pound 9 foot tall biped? No verified sign of such a thing anywhere, ever. A few dubious footprints if you want to accept them. One very dubious movie shot in 1967 if you want to accept it. Numerous hoaxes and copious amounts of garbage "evidence". So do you see branches or a rock, or something living and moving? I see 15 seconds of (poor) video of some woods. Ok, but Bigfoot doesn't exist in Kentucky.. or anywhere in North America. So what makes you think that you are seeing Bigfoot? Certainly there are better explanations for what you are encountering. They could include anything from homeless people to hallucination on your part. Sorry but I don't see anything in your videos but scenery. Scenery like what? Trees? Rocks? "Scenery" is a broad description, can you elaborate? What is your take on the dark object center screen? Chris, are you saying you see movement in the slo mo video? I watched it twice and I am unable to detect any sign of movement in the entire 1:57. How far away were you from the subject and why not move toward it? Yes, I see rocks and trees. The dark object looks like a dark, stationary object. Perhaps a burnt tree stump, but it's impossible to tell for certain given the low Res. I do not detect movement at all. If there was movement after all, I would have to guess black bear given the general shape and colour of the blob in question? Thank you for your honest interpretation. So to recap, the dark object looks stationary like a burnt tree stump, you didn't see any movement and if you had it could likely be video of a black bear. But it's impossible to determine given the low res anyway. Well said. The kindest thing possible is for me to admit the video is inconclusive due to the quality. But I do think it is worthy of study because to some, that bear is getting a back rub. Most of the photos on my site were failed attempts to capture good images of what I saw during those encounters. None, are acceptable as evidence of proof of Bigfoot. So why post them and claim that they are? When I see some cool bird but fail to obtain a photo of it I don't post my failed photos. As far as the Chimpanzee photo. . . . In my experience I would guess it was likely someone of a skeptical nature that made that photo available on WIKI for whatever reason. You think it was intentionally mislabeled? If you checked out that photo on your own accord and suspicions, . . . I didn't have any suspicions about the photo. I assumed that when I clicked on the link I'd see a cool, old-timey, gory hunting photo depicting a gorilla. It took about 2 or 3 seconds for me to realize that it was actually a chimp in the photo, but I doubt I would've noticed had I not clicked the photo link to examine a larger version. I know you think you've caught a bunch of skeptics failing to be skeptical, but closer to reality is that, using information you obtained from me, you observed a classic phenomenon in human perception. It's nothing more than a "Paris in the the spring" moment and you're trying to cast it as some great failing of the JREF. I just love this part!!! Chris, how do you know others don't go there? Last edited by GT/CS; 16th August 2013 at 06:39 AM. Any movement toward the creatures would have provoked a response. The spooky new age music really helped me focus on the black blotch in your video. Please, pretty please with sugar on top, won't you take this discussion to the appropriate topic? This has nothing to do with the Patterson Gimlin film. Thanks. I'v been sleeping on a futon in a cabin in the upper Bruce Peninsula all week. A Bigfoot back rub sounds good right about now. For those that couldn't view Chris' video, here is a still of "a family of primates doing primate-type things." I have circled the primates in red. Did it ever occur to you that you should get closer? So what if it attacks you, humans have been beating other animals at the killing game for million years. You think an animal is going to attack four people in the woods, that might have sidearms? Bigfoot knows about sidearms, and wouldn't attack people if they were packing heat. Funny, when I saw the pic I thought, "Wow, that's a chimp", remembered the De Loys ape stuff and moved on... Someone messes something in the internet... Great news. Aniway, please, those blob pics are not PGF. Bigfoot follies or latest bigfoot evidence are the right places for it. They ones he met there told him so. Classic footer behavior, see figfoot, flee bigfoot. Chris, it's been asked upthread but not answered I think. Could you please describe your time spent studying primates in the research centre? I think this research method is closer to Roger Patterson's than Gorilla researchers. After searching for years, he finally found a Bigfoot and then never returned to the area again. "Hmmm... shall I go back to Bluff Creek where I know there are Bigfeet. Nah, I'll head to Thailand." You took a blurry video from 200 yards away and then turned and left. For comparison, here's an example of the kinds of photographs real Gorilla researchers are able to provide via their methods. I don't need to hop the fence to get a clear picture of the Gorilla at the zoo. That has no relation to you standing 100 yards from your subject, and being afraid to walk 20 paces towards it. Real animals let you know when you are too close. This is an evolutionary response, resulting in less actual combat. If animals attacked everything that got too close, instead of signalling, then they would not be long for this world. Last edited by Drewbot; 16th August 2013 at 09:17 AM. No need. We know from the Patterson film that a Bigfoot will just mope away in complete disregard for the man running directly at it pointing a shiny metal object. Three weeks ago I was at the Amazon jungle with my wife and 7 years old kid. We've got lots of nice pictures from ellusive animals, including the nocturnal ones. And we went there during the end of the highwater season, when its harder to see animals. To make things more difficult, the moon was full. Of especial interest were some very intelligent and rare animals - the red river dolphins. They were "habituated", like footers claim some bigfoots are too. There were seven or eight of them around us and I got tired of taking pictures and shooting underwater movies from them. High quality, no blobs. That's what should be happening if footers like you were right. So, if you ever run in to a real animal, instead of a fantasy, try taking some pictures, OK? Its not that hard, unless there's nothing there, its just your imagination. Footers' failures to demonstrate bigfoots are real are not because bigfoots are fearsome but stealthy buggers or because skeptics are close-minded mean denialists.